MOA Galleria - Mall Coming Soon! 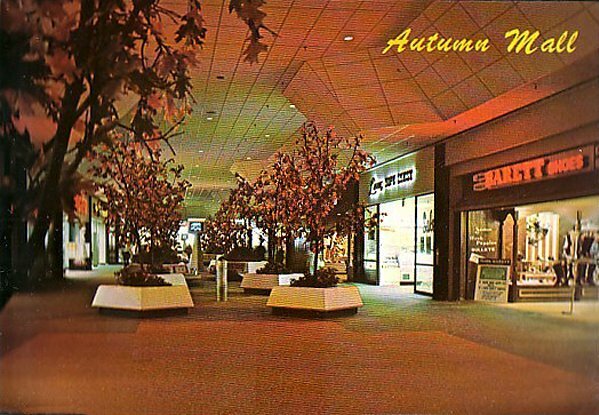 "Oak trees in fall colors adorn the Autumn Mall heading to the Watt & Shand Department Store. Park City is a Super Regional Shopping Center situated along U.S. Route 30 Bypass in Lancaster, Pennsylvania." PS: Blogger's giving me trouble at the moment (and the ice storm today here in MI is making my internet connection very unhappy), so I'm not sure I'll be able to get all the things posted this evening that I planned. If not, then later tonight hopefully. Let's see if this one goes through first. The picture is very kind to the ambiance of this mall; it was the typical dark, earthtone 70's mall that we've all seen in the past. Don't let the creative framing of this shot fool you. The last time I was there they had renovated it and replaced the indoor/outdoor carpeting with tile, and introduced natural lighting via skylights giving it a more contemporary look. Ah, nice work. MOA finally has all four 'seasons' of Park City represented. I think I like this particular one the most out of the four. 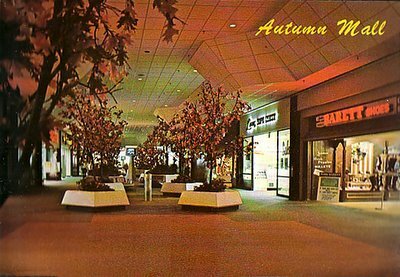 It has that nostalgic 'moody' feel thanks to the woodtones (the autumn trees in the foreground really bring this out), along with storefront lighting providing most of the illumination to the mall interior. I'm having trouble remembering if anyone liked dark and moody? Seems like the Seventies was full of dark and moody design. I suppose it was a stark contrast to what came out of the Sixties that it was just new nad different. Either way, I look at it now, and I think "gee, if I dropped a penny, I'd never find it!" Nevertheless, this is an awesome architectural wonder for the period. Love the creative use of ceiling tiles. I'd love to see all four seasons put together! With the exception of the first postcard posted on this mall with those great columns, Autumn is my favorite out of the other two. It just really brings the outside come to life. Screw skylights and natural light. I would take dark malls and earthtones any day over something so pathetically bland. If I wanted to feel like I was outside I would visit one of those goofy big box centers or fauz streetscapes or worse yet go to Old Orchard. With the themes of the seasons being presented at Park City, how come all malls succomb to the cultural blandness instead of adopting fun themes like this? To me it's just so bizarre that something fun couldn't be celebrated today for fear of being outdated. you can find a mall in almost any part of the world, in a ship, in mountains, in desert, in one frozen zone, and inclusive in a park. I think the best thing we can get is to go to the Mall and buying like a crazy woman in order to avoid all things we have had during day. I continue visit on this site for more information. I lookig the top of America hotels.. who know where can i find them? I am pleased to have read some of them on your blog.